Last year, I was very unkind to LeBron James. Like many people, I was put off by his supreme arrogance. I had been having difficulty forgiving him for the Decision– that abomination of televised self-love on ESPN where he announced he’d be taking his talents to Miami. It was hard to get over the image of the special effects, smoke-filled introduction of the Dream team in Miami, in which it appeared three Gods from Mt. 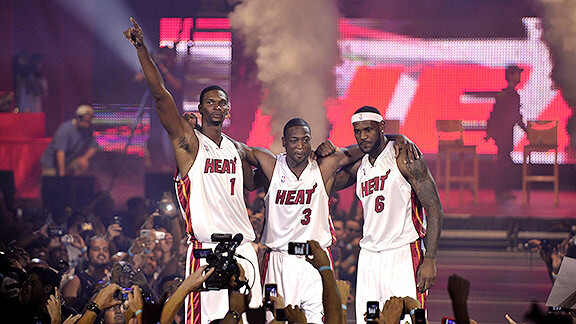 Olympus (LeBron, Wade, Bosh) had descended down to earth to predict, I think it was- 8 championships. And when ousted from the playoffs last year, I didn’t like it when he said all of us haters out there would return to our screwed up little lives while he would be going back to Olympus where, presumably, he would get back to his posse peeling grapes for him. As a Cleveland Cavalier, I remember, (back when the Washington Wizards used to get into the playoffs), when LeBron psyched out Gilbert Arenas standing at the free throw line, whispering something like “you’re going to miss these.” Who does that? The Washington Post’s Mike Wise, who is covering the NBA finals, has been on a campaign to convince the public that LeBron has changed. And based on his recent post-game news conferences and recent interviews, there’s every indication he really has. I can see now if the shoe was on the other foot and I was a fan and I was very passionate about one player and he decided to leave, you know, I would be upset too by the way that he handled it. It basically turned me into somebody I wasn’t. You start to hear ‘the villain,’ now you have to be the villain, you know, and I started to buy into it. I started to play the game of basketball at a level, or at a mind state that I’ve never played at before. . . meaning, angry. And that’s mentally. That’s not the way I play the game of basketball. I was very hurt that I let my teammates down, and I was very immature. Like I said, last year I played to prove people wrong instead of just playing my game, instead of just going out and having fun and playing a game that I grew up loving and why I fell in love with the game. So I was very immature last year after Game 6 towards you guys and towards everyone that was watching. He seems to get it now. And he seems to be playing for the right reasons- joy instead of anger. I buy it. I am convinced. His actions on the court have spoken for themselves this post-season. He is a force. He plays in pain. He comes through in the clutch. And now, in his own words, he clearly recognizes how he managed to cast himself in the role of villain. It’s time to give the guy a break. 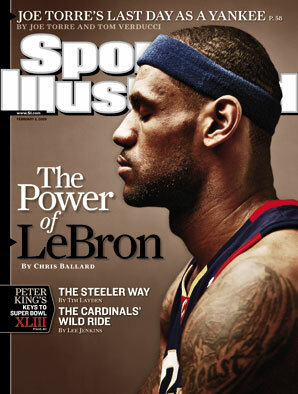 And if he finally helps his team win an NBA crown tonight- he will have begun to justify that his status as the “King,” as royalty in professional basketball, is deserved and not just an exaggerated marketing ploy to feed the LeBron James empire. Suddenly- these days- I like the man a hell of a lot more than I ever liked the brand. I wasn’t rooting against LeBron James, per se. I was rooting against hubris and arrogance. I was rooting for karma. I was rooting for the principle of the understated work ethic. And sure enough, the good guys won. 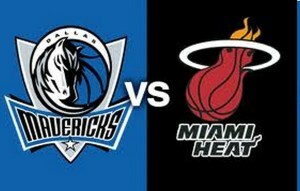 Congrats to the veteran and classy Dallas Mavericks for claiming their first NBA title. As for LeBron, he left with this parting shot to the millions of basketball fans across the nation that he turned off with his ESPN “Decision” extravaganza as well as the laser-show, smoke-effect introduction of the next dynasty he glibly predicted would win, I think it was, 8 NBA titles in a row. I suppose it’s understandable that a guy in his mid 20’s who had to face as much criticism as he did this year, would have to vent, and vent he did. The question was, does it bother you that so many people wanted you to fail? Absolutely not, because at the end of the day, all the people that were rooting on me to fail, at the end of the day, they have to wake up tomorrow and have the same life that they had before they woke up today. They have the same personal problems they had today. I’m going to continue to live the way I want to live and continue to do the things that I want to do with me and my family and be happy with that. You see, I spent every waking hour this year rooting for Miami and LeBron to fail. I put all my personal problems aside so I could do nothing but send withering hate-rays at LeBron James, Dwayne Wade and Chris Bosh. From November all the way through last night, it’s all I thought about. I remember the night someone on my news staff called to inform me that Osama Bin Laden had been killed. “Osama, who?” I asked incredulously. “My God, man, the Miami Heat are playing tomorrow, I’m practicing my piercing voodoo hate vibes, leave me alone!” I pleaded. Frankly, I’m exhausted from all this non-stop hating. Plus, putting off dealing with life so I could spend quality hours despising the Miami Heat has caused me to have this tremendous backlog of personal problems to attend to. Man, LeBron, you’re right. I do have to get back to the real world- whew- thanks for reminding me, dude! LeBron James has all but disappeared in the 4th quarters of the last two games of the NBA finals and amateur psychologists among the nation’s sportswriters are weighing in with their theories. Mike Wise of the Washington Post has a good one. 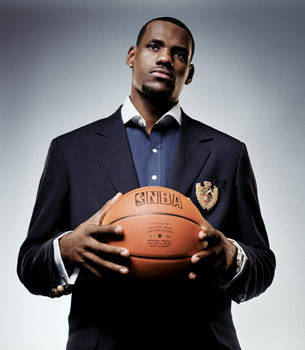 He thinks that in Cleveland, everything depended on LeBron and the responsibility was just too much for him to handle. Teaming up with Dwayne Wade and Chris Bosh in Miami was the answer; he would no longer have to carry an entire team solely on his back. Except last night, in the pivotal 5th game of the series, Wade came up lame with a hip injury. Chris Bosh had reverted to the critical nickname they use for him derisively at times in Miami- “Flower Forward.” That left LeBron as the man. And he scored two points in the 4th quarter. Earlier he’d been great, posted a triple-double (double digits in points, assists and rebounds). The other widely heard theory as that when he tweeted prior to last night’s game that it was “now or never,” he put way too much pressure on himself. Though he has no shortage of ego, I’m hearing Miami fans this morning saying that, ironically, King James has to be more selfish about scoring if the Heat are to prevail by taking the last two games of the series at home. Actually, with all due respect to his tremendous talent, it’s character that usually comes to the fore in a championship series. I’m sure LeBron will eventually develop some- and this may be the experience that does it. But the mistake here made by the media and most of the public- is that the wrong King was being crowned. 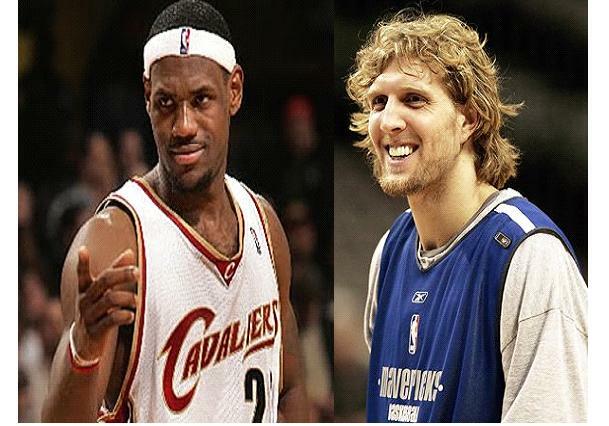 The real royalty in the NBA is not from Ohio- he’s from Germany and his name is Dirk Nowitzki. Now that’s a guy who plays well under pressure. Torn tendon in the finger of his non shooting hand? No worries. Uses the injured finger and hand to make the lay-up that closes out game 2 in Miami. Sinus infection and 102 degree fever? No big deal, makes every clutch shot in game 4. Here’s how I see this playing out. Heat win game 6 at home forcing a decisive game 7. Nowitizki comes through in the clutch, gets his elusive trophy he lost to Miami five years ago and the Dream Team finishes with in an inexplicable whimper. And then Miami goes on to win the next three NBA championships having developed some of the character that was missing in their NBA Finals debut. I swear, sometimes I think that’s all God demands every now and again. Just a little humility. That’s what the Miami Heat are in the process of developing right now. Except, of course, I didn’t actually watch it. As soon as Dwayne Wade hit the 4th quarter 3-pointer and posed for 5 seconds in front of the Dallas bench and his highness, LeBron, did this chest thing with Wade- I was out of there. I was determined not to watch these preening egomaniacs turn the NBA Finals into their personal playground. Apparently, I wasn’t the only one who was disgusted. The Dallas Mavericks had had enough sand kicked in their face and they responded with one of the greatest comebacks in the history of the NBA Championship. So I missed it, but have enjoyed reading about it, immensely. The Heat are going to have earn it now and that’s the way it should be. The NBA Finals are nobody’s personal playground. They may yet be the champs. But, surely, they will have learned it’s not only talent that makes history. A little class usually goes along with a ring too. They still have a chance to show some. Sportswriters are telling us to get over it. To get over the ego of LeBron James; forget the tastelessly tacky ESPN announcement show where he jilted Cleveland; ignore the three-ring, laser-circus Miami Heat signing event in which LeBron, Dwayne Wade and Chris Bosh stood on platforms posing like Greek Gods. We’re supposed to sit in awe at this dawn of a new dynasty led by a guy many are now calling the greatest basketball player who ever lived. No- I don’t think so. I’m not going to like this one bit. I like my heroes slightly humble and with more than one dimension. Mickey Mantle was deeply flawed but he had the humility to go along with the once-in-a-generation talent. Muhammad Ali backed up his arrogance with grace and power but there was more to him than boxing; he sacrificed the best years of his career on principle- opposing participation in the Vietnam War and refusing induction into the U.S. Army on religious grounds. One gets the sense the only thing that matters to LeBron James is basking in his own wonderfulness, an exercise that is much easier to do when you have your own huge posses who constantly remind you of your greatness. I remember his famous return to Cleveland back in March. LeBron reportedly doesn’t like to ride on the team bus and he makes his own travel arrangements. But on this occasion he didn’t clear it with anybody so when he turned up at the player’s parking lot in a limo with a second vehicle behind him carrying his posse of friends, the Cleveland Cavaliers turned him right around. They let him in once he’d come back alone. Then he skipped the pre-game introductions in his old hometown, claiming he forgot and must have been in the bathroom. He’s got all the talent in the world. Miami has the best basketball team money can buy. So what? The only actually interesting thing about these NBA Finals, is if Dirk Nowitzki and the Dallas Mavericks can somehow manage to derail this Hollywood Dream Team and inject in them, that missing sense of humility. Maybe the addition of a little character will make all the egos a little easier to take. Oh- so you’re good at basketball? Yawn. Hockey is a much cooler pastime anyway. I have a thing for team sports.